I have had many Giant Pumpkins and Squash with seeds in the blossom behind the "stigma". Those tiny seeds belong in the fruit and your fruit will develop slower in the area where those seeds should have been. Most of the time the area slow to develop is near the blossom end. 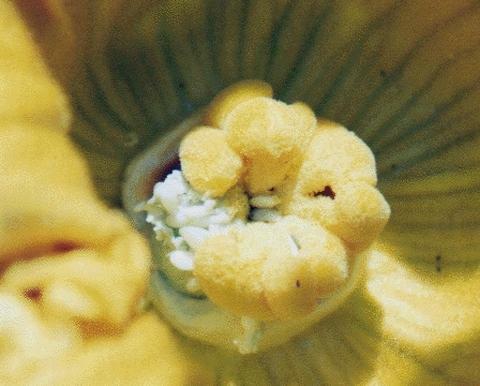 I remember a Squash in 1991 that had many seeds behind a segment at about 2 o'clock as viewed from the blossom end. As it grew a huge depression resulted the entire length of the Squash. It split in the depressed area at 539 pounds. Since that time I look for appendages with tiny seeds behind the stigma. If I see seeds, the fruit is removed, as I know the result will be odd shaped fruit that may split in the area not developing properly. Sometimes the stigma looks normal and other times the segment in front of the seeds is deformed. The photo provided by Amy Dopp is an extreme case of "seeds on the blossom" and it appears a segment is missing. If a segment is deformed, be sure to look behind it for an appendage with tiny seeds. Most of the time the seeds are easy to see. However, in 2000 the first fruit on an Eaton 780 plant had seeds at about the 5 o'clock location that I didn't see. The lower part of the blossom was touching the ground. About 10 days later the dried flower was removed from the blossom point and the shriveled seeds were there. I didn’t remove it at that time (I should have) and it looked good until about 100 pounds. Then it was as if 1/4th of the fruits length at the 5 o'clock area stopped growing. I removed it at 195 pounds. "Seeds in the blossom" is a lengthwise problem and not likely to cause Dill rings. However a Dill ring may crack thru quicker in a depressed area. Some plants have this problem for a high percent of their fruit. If you find a fruit with seeds behind a segment of the stigma, check all fruit on that plant carefully. Two years ago a 1056.5 plant had seeds in at least 1/2 of the fruits blossoms. I recently heard from a grower that had a 1056.5 plant and the fruit he left had seeds in the blossom. The fruit split at 455 pounds in the deformed area. One of 4 Geerts 946.5 plants I grew had a lot of fruit with seeds behind the stigma. I do not know if the problem is inherited.